Day Zero. Mike's flight from State College is over booked and he is the one they say cannot board. Mike explains that he is carrying both our passports and visas and the cascading effect his missing this flight would have. USAir buys off another passenger and the trip begins. Had our first traffic accident on the way from the airport to the motel. The shuttle driver rear-ended a guy at a yeild sign. No big deal. We found an Internet cafe near the motel. It's pricey, but should work well while we are in Lusaka. Together we are Zambian millionaires. The smallest bill we've seen is a 500 Kwacha note. The exchange rate is 3125 K per $. You do the math. 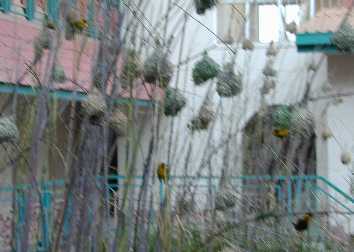 The motel has weaver birds in the atrium by the outdoor cafe. The males were putting on quite a display during dinner. We had been frantically trying to meet with our local contacts all day. That finally happenned in the late evening. Now we know our plans for the "field trip": Tomorrow we drive to Mpika, a small community in the northeast of the country. We visit there and other nearby villages for two days and then head southwest to Mufulira in the Copperbelt by the border of Zaire. We'll be there for two days before heading back to Lusaka. We'll be sleeping in grass huts and dayhiking to get to some of the villages because there are no roads to them. Oct. 4. Travel to Mpika (mostly north and a little easting from Lusaka). The road doesn't reach Mpika. We will drive the bus until we have to stop and then walk. Allegedly the accommodations include a grass hut. Oct. 5. We meet with Tribal Council Secretary and District Administrators. Then we meet Chief Chikwanda. Each community we are analyzing consists of all the landscape ruled by a chief. This is a lot of land. Then we meet at Kaole and Kaombe. Oct 8. Meet with three communities called Mupena, 21 miles, and 14 miles The latter two must think they are Erie County creeks. Oct.9. Meet with more council secretaries and with the communities of Kansunswa and Kawama. Oct 10. Return to Lusaka. We are packing only film, deet, toilet paper, and underwear. There are no phones, no lights, no motorcars. Not a single luxury.